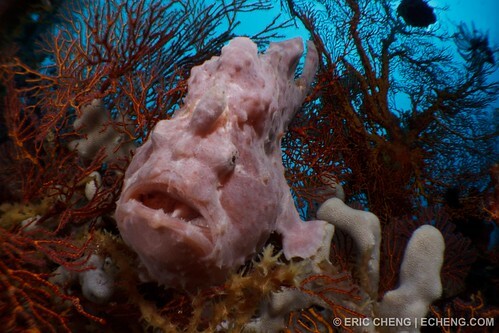 Large frogfish, Eastern Fields, Papua New Guinea, originally uploaded by echeng. Craig, the captain of the M/V Golden Dawn, went crazy when he saw this frogfish on one of our dives yesterday. Apparently, large frogfish are rare in the Eastern Fields. We've also been enjoying the company of quite a few lacey scorpionfish (Rhinopias aphanes). For some reason we have been finding them on nearly every dive site.